Lost in outer space, dude. This is mostly an American cartoon, but since it was done by Anime company TMS, also responsible for in between animation for Batman The Animated Series, I can see how this ended up here. BOY is this dated. If you loved the 1980's, this should be right up your alley. The premise is cute, and the show was ripped off of by many other shows i the 90's and early 2000's, with even Disney ripping a few ideas from it, but the fashion will remind you of that horrid Jetsons reboot from the same decade. Plots are predictable, and the biggest flaw is that the talking never stops. There's barely more than 15 seconds of silence from one scene to another, and many of the sound effects just feel recycled from non-space cartoons. There's a moral in most episodes, which proves that the show is about more than shameless teenage jokes. It was a Saturday morning series that was cut short at just 13 episodes. Wow! This series really takes me back to my childhood in the 80s. I loved this show and enjoyed it a great deal during it's original run (1986). It wasn't one of the top shows back then but it still holds a special place in my heart, right up there with Kidd Video. I loved this cartoon as a child. Sometime I yearn for nostalgia and this is one of those shows ill watch to get my fix. Its a cute show, very American, and a good laugh. It may get tiresome for some, but if you love the 80's you will like this hidden gem. One of my favorite 1980's cartoons. Very imaginative and colorful, with a likable cast of over-the-top characters for Doyle and Aimee to interact with, great music from former Eagle Don Felder, and a pre-Simpsons Nancy Cartwright. Much of what I enjoyed about this series would be carried over into a much later favorite of mine, Futurama. Galaxy High, I Iove the 80's I LOVE IT!!! This show is a huge bite out of 80's nostalgia including the pop synth music and a say no to drugs episode. (common forced goverment practice) It has great characyer design, and decent animation specialy for the time. 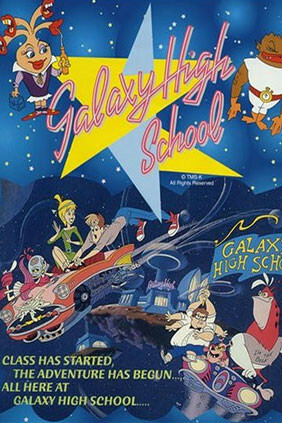 The main characters are 2 humans picked to enter the galaxy high school. The rest is told in the intro song. In this Alien place apparently being smart has rewards and being a slacker makes you the lowest in the food chain. Aimee the smart nerd becomes a goddess babe and Doyle the big man on camps becomes an instant loser who cant get an even break and get away with everything like he did back on Earth. It has some nice lessons, and its a chunk of nostalgia. I love this show, character designs is good, voice acting is decent, some stuff is corny like the dialog, but can you STAND IT! BTW it may get a remake.